Are bond funds a safe haven if the stock market crashes? With interest rates about to rise, is it a good time to invest in a bond fund? These are questions investors may be asking themselves as the stock market may be peaking and the Fed keeps jacking up interest rates. If you are fearful of what may happen in the stock market, you may also be considering putting money into one of the popular bond ETFs. Read further to understand that a bond fund comes with its own set of risks, ones that the financial services industry won’t tell you about. Let’s start with the basics of bonds. When you buy an individual bond, you are in effect making a loan to the issuer. You will receive a fixed rate of interest until the bond matures. At that time, you will receive the face amount of the bond. For example, if you buy a $10,000 face value bond with a 4% coupon yield, you will earn $400 per year in interest and get the $10,000 back when the bond matures. Bonds are marketable securities, which makes current yields and prices more interesting. Interest payments from bonds are fixed, so the market adjusts for changing interest rates by moving bond prices. Using the example bonds, if current interest rates were greater than the 4% coupon, the bond would sell at a discounted price, below the $10,000 face value. If current rates for comparable bonds are lower than 4%, the bond would be priced at a premium, or higher than the $10,000 face amount. If you think about it for a while, this makes sense. Changing bond prices allow bonds to reflect current rates. When you buy a bond at a discount or premium price, the dealer will quote you a yield-to-maturity. This is the actual annual return you will earn, accounting for the discount or premium and coupon payments if you hold the bond until maturity. Now you know more about bonds that the majority of bond fund owning investors. The next step is to understand how a bond fund or ETF differs from owing individual bonds. The fact that bond fund investors don’t grasp is that a bond fund does not have a maturity date when a face value will be paid. A fund is constantly buying and selling bonds as investors buy and sell shares of the fund. Many funds also have a target duration or time to average maturity. This means they will sell bonds as their maturity shortens to buy longer term bonds. 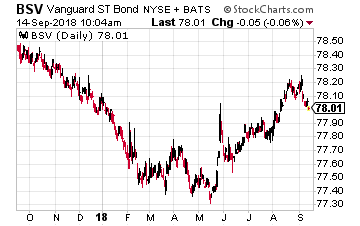 Because of the open-end maturity of a bond ETF, when interest rates go up, bond prices and the fund’s share price will go down and that price will not recover. The only thing that will cash a bond fund’s price to increase is declining interest rates. This means in an extended period of rising rates; bond fund investors will see their principal decline without the possibility of a recovery. Here are three examples of popular bond funds and what could go wrong with an investment in each. 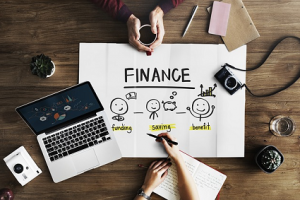 As a defensive move against rising interest rates you will often see financial advisor recommend a short-term bond fund such as the Vanguard Short-Term Bond ETF (NYSE: BSV), which $25 billion in investor money. This fund has an average portfolio duration of 2.7 years. A rough rule of thumb is that a bond portfolio will decline by the duration for every one percent increase in interest rates. This means the BSV share price will drop by about 3% for each one percent increase in rates. Not exactly a safety of principal investment. For all of that “safety” you get a current SEC yield of 2.84%. Bottom line: Short-term bond funds are not as safe as advertised. High yield bond funds such as the $16 billion in assets iShares iBoxx $ High Yield Corporate Bond ETF (NYSE: HYG) pay a more attractive current yield, but with added danger to your invested principal. High-yield is the term for non-investment grade bonds. These are also called junk bonds. The low credit ratings of high yield issuers mean the companies behind the bonds are more at risk of default. High yield bonds can be a good investment if the economy is doing well. However, when a recession hits, defaults in the high-yield universe sky rocket. 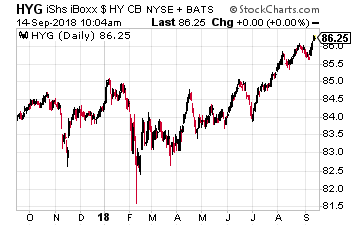 A fund like HYG will lose significant value as investors run for the exits and the fund managers must sell their best bonds to pay off redemptions. 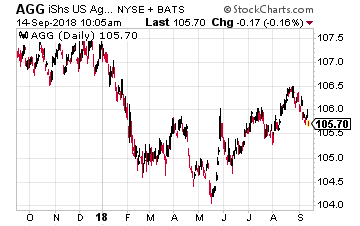 It could get very ugly and not worth the current 5.7% SEC yield. The iShares Core U.S. Aggregate Bond ETF (NYSE: AGG) is the largest bond ETF with $56 billion in investor money. The fund is touted as a diversified way to cover the full range of investment grade bonds. Total bond funds like AGG are the less well informed financial advisors’ recommendation to get bond exposure in an investment portfolio. Unfortunately, this fund has a weighted average maturity (very similar to duration) of over eight years and an SEC yield of just 3.1%. A one percent rise in average rates would cause the fund share price to drop by about 8% a 2% increase would be a mid-teens loss of principal. Not a good trade off to earn 3% per year. Join options portfolio manager Jay Soloff on Wednesday, September 26th for a special live interactive training that shows you how to amplify returns on your stocks with almost no effort. It’s part of the Disruptive Dividends strategy he and dividend expert Tim Plaehn are using that sports an 87% win-rate. Plus, you’ll get their 4 current trade set-ups that you can execute right away. Registration is free. For details just CLICK HERE.